America's Oldest Speed Shop®. 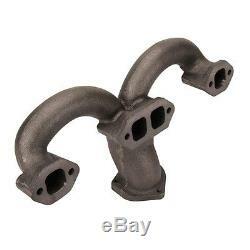 Tru-Ram® Small Block Chevy Exhaust Manifolds, Cast Iron. 3-1/2 from cylinder head surface to outside point. 3-1/2 from bolt center to top of manifold. 5-1/2 from manifold bolt center to bottom of collector. 2-1/2 collector uses standard header reducers. If you're looking for the power of headers, a distinctive look and the dependability of cast iron, we have the hot setup for small-block Chevys: the Tru-Ram® exhaust manifold. We started with a clean slate and designed an exhaust manifold that will give you looks and performance never before available in cast iron. Provides a tight-fit for steering and clearance issues. Flows better than original Corvette manifolds. Same performance as tube headers with classic ram horn styling. 2-1/2 collector uses standard reducers or tight tube extensions. Includes mounting hardware and gaskets. Note: The exhaust port size is square and large enough for most round port heads. It measures 1.375" x 1.375" and should be sufficient for most small block cylinder heads. Variation in location of spark plugs on aftermarket heads makes it impossible to verify that the Tru-Ram®. Will fit all heads on the market, but it will clear most straight and angle plug heads. Fits great in a variety of street rod and vintage truck applications - particularly those with Mustang II-type suspensions. Will not work with GM "fastburn" heads. Watch the video below to learn more about Speedway Motors Tru-Ram Exhaust Manifolds. Great product - I ordered the cast iron version! By West TN Willys on June 20, 2015. Using the manifolds on a Willys wagon restification! Plenty of clearance, both steering and framewise! Yes, I recommend this product. By CobraFFR on August 15, 2014. Just got them delivered today and they are a really nice piece. My engine is on the stand an not in the vehicle yet so I don't know how well they will fit in my truck. But, I wanted to let folks know that mine came with all the bolts and gaskets needed for installation. Description omitted bolts and gaskets. AN OUTSTANDING ALTERANTIVE FOR HEADERS. By sfcrob on July 23, 2014. I HAVE A 82 C10 CHEVY TRUCK WITH A GOODWRECH 350 CRATE MOTOR. I FIRST TRIED A SET OF FLOWTECH HEADERS THAT DROVE ME NUTS WITH CONSTANT HEADER LEAKS. I SAW THESE, AND AFTER A BIT OF RESEARCH DECIDED TO TRY THEM. THE LEFT SIDE FIT PERFECT WITH NO PROBLEMS, AND AFTER A GRINDER, WITH SOME MINOR GRINDING ON THE RIGHT SIDE MOTOR MOUNT "BAM" IT SLIDE RIGHT ON. I TOOK A CAN OF KBS SPAY ALUMINUM HIGH TEMP PAINT, AND PAINTED THEM PRIOR TO INSTALLATION, AND THEY REALLY MAKE A NICE COSMETIC UPGRADE TO THE ENGINE COMPARTMENT. THOSE RUSTY LOOKING HEADERS CAN'T COMPARE TO THE LOOKS , AND OVERALL PERFORMANCE OF THIS SETUP. GREAT LOOKS, FIT, AND EXCELLENT OVERALL SOUNDS. NO DOWNSIDE TO THIS WHATSOEVER. JUST AS GOOD AS HEADERS WITHOUT THE HEADACHES!!!!! By Woodswarrior on May 14, 2014. Installed on my 64 Chevy C20 with 350 V8. No one here has seen any before. Look great, fit great, lots of room to run wires behind them. Coated mine with high temp ceramic aluminum manifold paint. Didn't want the sound of standard headers, and wanted the durability of cast iron. Related Items / Suggested Parts. Small Block Chevy Louvered Exhaust Manifold Covers, Chrome, Pair. 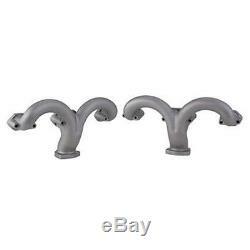 Tru-Ram® Small Block Chevy Exhaust Manifolds, Unpolished Stainless. Tru-Ram® Small Block Chevy Exhaust Manifolds, Polished Stainless. 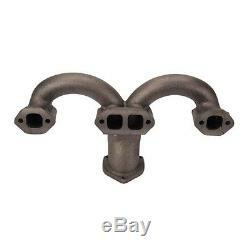 Corvette Style 2-1/2 Inch Ram Horn Exhaust Manifold. Tru-Ram Small Block Chevy Exhaust Manifold Gasket Set. Stainless Header Reducer Kit, 2-1/2 to 2 Inch. Header Reducer Kit, 2-1/2 to 2 Inch. Please pay for all items at the same time. We cannot combine your order if you have already paid. Not sure this part will fit? Speedway Motors is Americas Oldest Speed Shop® and has been a trusted source for specialty rodding and racing products and friendly expert advice for more than 58 years. Repack the item in a sturdy box, include a copy of your invoice and complete the form on the back of the invoice. All exchanges need to have reshipping charges included. Speedway accepts full responsibility for the accuracy of our listings and product representation. The item "Tru-Ram Small Block Chevy Exhaust Manifolds, Cast Iron" is in sale since Wednesday, April 08, 2015. This item is in the category "eBay Motors\Parts & Accessories\Car & Truck Parts\Exhaust\Other". The seller is "speedway_motors" and is located in Lincoln, Nebraska. This item can be shipped to United States, to Canada, to United Kingdom, DK, RO, SK, BG, CZ, FI, HU, LV, LT, MT, EE, to Australia, GR, PT, CY, SI, to Japan, to China, SE, KR, ID, to Taiwan, ZA, TH, to Belgium, to France, to Hong Kong, to Ireland, to Netherlands, PL, to Spain, to Italy, to Germany, to Austria, RU, to Mexico, to New Zealand, PH, SG, to Switzerland, NO, SA, UA, AE, QA, KW, BH, HR, TR, BR, CL, CO, CR, PA, TT, GT, HN, JM.